Tone up your inner thighs with the adductor machine. The hip adductor machine promises sleeker, more toned thighs by working your adductor muscles. Five muscles make up this muscle group: the pectineus, adductor brevis, adductor longus, gracilis and adductor magnus. While you cannot specifically spot reduce your thighs with the adductor machine, you can tone and strengthen these muscles, helping you slide into a smaller pair of jeans. At most gyms there are are two common adductor machines: the seated and the lying hip adductor. 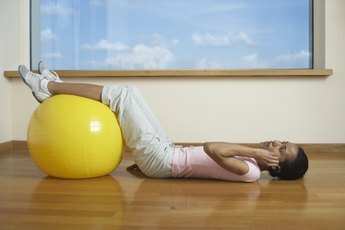 The word adduction means moving a body part toward the center of your body. When you use this machine, you start with your thighs apart and fight against weighted resistance to press them together. Your hip adductors are one of the largest muscle groups in your legs. It is a complex muscle group located deep in your inner groin and inner thigh. These muscles are often hard to find because they are buried under other muscles, such as your quadriceps. You use them any time you climb stairs, walk up a hill or stand up. Your adductor brevis, longus and magnus are your main adductor muscles. Your adductor brevis is quite short; it begins at your pelvis and inserts into your upper femur. Your adductor longus and adductor magnus are longer and larger adductor muscles. They begin at your pelvis and attach on the middle and the lower part of your femur. Your pectineus is the most anterior adductor muscle in your hip. It has a rectangular shape and runs from your pelvis to your femur. It is similar to your adductor brevis in length and attaches to your upper femur. In addition to helping with adduction, it helps with bending your hip. Your gracilis is your longest adductor muscle. It is the most medial, or inner, adductor muscle. It starts at your pubic bone and stretches all the way down to your upper tibia, or shinbone. This muscle plays a vital role in hip adduction and knee flexion. What Muscle Groups Do Walking Lunges Work?